Another of Vancouver Aquarium's cetaceans has died, only three months after their beluga Nanuq passed away at SeaWorld. Hana was one of the aquarium's two remaining captive pacific white-sided dolphins, imported from Enoshima Aquarium in Japan several years ago. Her passing brings the total number of cetacean deaths at the aquarium to over 40, many of them coming after failed attempts at captive breeding. Hana's age was estimated at about 21, far younger than the 40 years of age that Pacific white-sided dolphins are known to survive in the wild. Although the aquarium failed to mention this fact in their press releases, they did manage to say that despite uncertainty around the cause of her ailment, they were quite certain it was not related to being in captivity. Whenever a zoo or aquarium animal dies, there's a standard communications protocol that goes into action. And like every other PR protocol zoos and aquarium's use, its sole purpose is to try to prevent people from asking probing questions. This is because aquarium management know that after the death of a captive, performing animal, much like when a human dies, people naturally tend to reflect upon the life of that animal. And this is the one thing that aquariums don't want people thinking about, lest they discover that a life in captivity isn't much of a life at all. The cornerstone of the this plan is to label anyone who dares ask questions or raises the ethics of captivity as "callous" and "unfeeling" for attacking them in their hour of grief. But this time, the Vancouver Aquarium's crack communications team slipped up and pointed the finger at themselves. Most people - say, upon the loss of a companion animal - would take some time to grieve before entertaining finding a new companion. It's sign of caring, a symbol of respect for a life-long friend. Yet, even before Hana had passed, Vancouver Aquarium management weretalking about replacing her with another dolphin. It's a coldhearted admission by the aquarium that highlights a fundamental truth they normally take great pains to hide from the public: As much as the staff and volunteers may have a genuine affection for the animals, the whales and dolphins at Vancouver Aquarium are, first and foremost, a commodity. To those of us in the anti-captivity camp, this is hardly a surprise. Leaping dolphins sell tickets and since it is so difficult to put on synchronized acrobatic dolphin shows with only one dolphin, it's also no surprise they would be anxious for a replacement. But what makes this a truly startling admission, is how much more it says about how they really see their dolphins and whales. Because by admitting that she is so easily replaced by another of her kind, they have stripped Hana of all her individuality. The most remarkable and truly wonderful thing about dolphins is that they are sentient, intelligent and self-aware creatures. They're some of the very few that we have been able to identify among all the animals that populate this earth. We know for scientific fact that they have individual personalities, lead rich emotional lives and are capable of highly complex social interactions. In many ways, dolphins are just like us (minus the opposable thumbs and the penchant for self-destruction). Yet for the purposes of aquariums and marine parks, dolphins and whales are treated as interchangeable, empty vessels. It is the ultimate disrespect. But that's the thing about aquariums and zoos. It is only by denying the very nature of these animals that they can justify keeping them in captivity. To acknowledge Hana as a thinking, feeling individual, would be to acknowledge her ability to suffer when her right to live as a wild dolphin was taken away*. * Vancouver Aquarium acquired Hana from Enoshima Aquarium and claims that Hana was rescued after being injured in fishing nets on the west coast of Japan and is unreleasable. 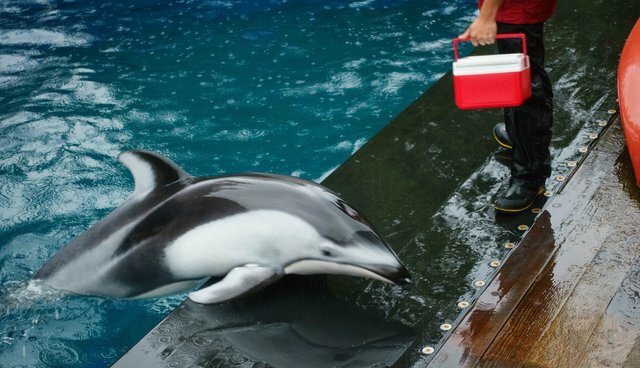 Others claim that this is a case of dolphin laundering, and that taking Hana and her companion Helen, Vancouver Aquarium helped Enoshima purchase more dolphins from drive hunts.